It's been quite a while since I last share with you on beauty stuff. Although I have many things that I would like to tell you either on makeup I have purchased, skin care I start to use, but it seems none of them appear here in 2018 blog post. Thus, I, the booknerd decided to bring it back on my blog. This start with a skin care beauty that I just recently discovered. 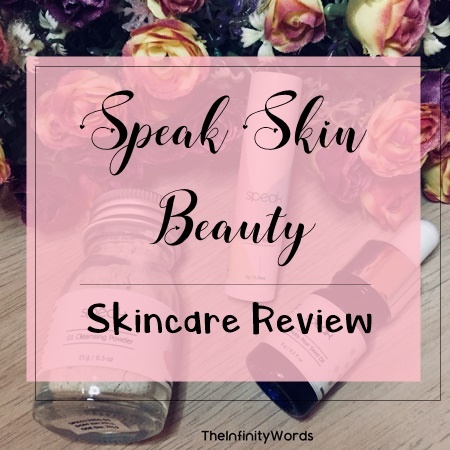 Have you ever heard about Speak beauty skincare product? With all honesty, I just found out it recently too. I, genuinely almost forgot about the advertisement they put on Facebook and I responded it long ago until they contacted me and kindly sent me a media kit of their products. Thank you, Speak teams. It is a natural based product that is founded by two amazing women - Nisa and Tiara. Both of them is the founder of Speak Skin Beauty with a purpose of empowering women with fair and reliable information, making a positive impact towards the community and environment which you can read more about it here. #1 01 Cleansing Powder - made with organic oats, lavender flower, kaolin clay, and sweet almond oil. Having dry skin when it starts to exfoliate, especially around my nose and cheeks area. It feels so annoying when I apply foundation and, I saw white flakes. At that when I started applied cleansing powder, I saw the difference it makes on my skin especially that annoying white flakes. Hence, cleansing powder by Speak has helped me in removing the dead skin cell and shoo away the dirt on my skin. It makes me fall in love with this product. Say no more I have found one that suits my skin. Direction: Pour a small amount of powder into your palm, drop a small portion of water to make a paste and massage it gently on your face and finally, rinse it. I remember my dad told me about a facial oil from Morocco which helps to nourish our skin. He knows from one of his friends who lived in Morocco and, I wonder about it. So, when I see Speak have a product - Prickly Pear Seed Oil sourced from a cooperative in Morocco, I am really happy to try to apply it to my skin and it feels so good on my skin. Apply it daily during the night so that, I wake up in the morning feels my skin fresh at it best. Prickly Pear Seed Oil is 150% more Vitamin E than argan oil. It's high in antioxidants and reduces inflammation. The facial oil helps to moisturize our skin, repair our skins and regenerate it. Direction: Drop 2-3 of the facial oil and massage gently on your skins. Apply daily during the night and/or morning on face, neck and décolleté. #3 03 Lip Balm made with castor oil, jojoba esters, macadamia seed oil, and organic beeswax. Another thing that surely bugs me every single day is my chapped lips. Therefore, it's important to make sure your lips stay hydrated all the time. Lip balm from Speak delivers ultra-rich moisture, and it protects our lips from dryness with regular use. Overall, I love how it suits my skin well and, I can see the difference it made on my skin. My favorite product is the cleansing powder. I definitely like it. For more information, about the products, to order, you may visit their website - Speak Skin Beauty.